The promotion of sustainable development underpins our lending strategy and objectives. We thoroughly examine the environmental and social risks and benefits in careful due diligence processes that are performed by the EIB’s Projects Directorate or their contractual partners. These take place both before an investment decision is made and at later monitoring stages. This approach provides guidance on our sustainability standards to project managers internally and to project promoters and financing partners externally. 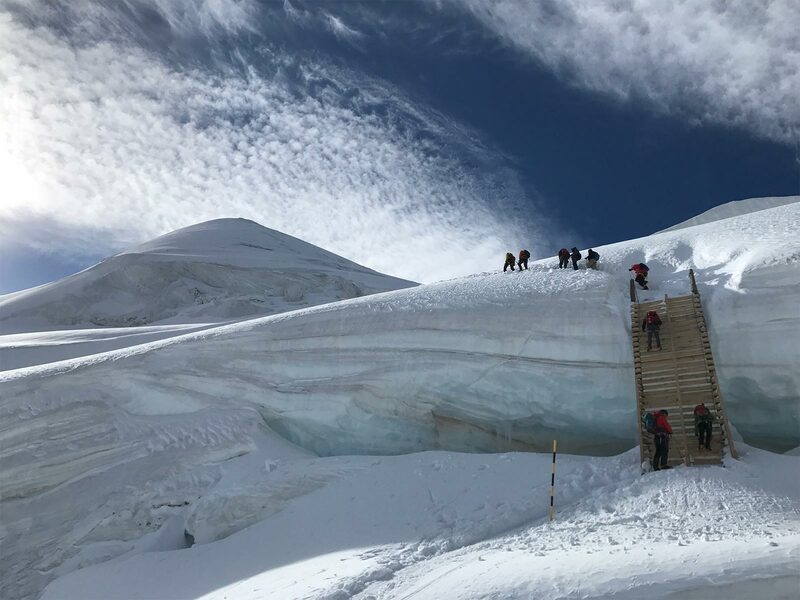 A large number of climate-related due diligence activities are carried out each year at the project appraisal stage – when project proposals and environmental impact assessments are appraised from technical, financial, economic, social and environmental perspectives. The outcome of the environmental and social assessments is summarised in an Environmental and Social Data Sheet as part of our commitment to transparency. Project-related environmental documents are available in the Public Register on our website. Analysis of our Carbon Footprint Exercise suggests that these two thresholds capture approximately 95% of emissions from the EIB’s investment projects. At the heart of our footprinting approach are the absolute emissions from each project. Whilst assessing and reporting emissions reductions and increases, which give an important indication of the emissions in comparison with other technologies or projects, we consider a project’s absolute emissions to be a fundamental element, as these are what will ultimately affect our climate. To review the total impact of our lending, we believe it is important to assess significant emissions from all sectors we fund, not only from green sectors. We include projects in our annual Carbon Footprint Exercise from the areas of conventional and renewable energy generation and networks, energy efficiency, transport, industry, water and solid waste, agriculture and forestry. This allows us to assess the contribution from each type of lending. Project level data for projects included in the Carbon Footprint Exercise are reported in our Environmental and Social Data Sheets and published in our public register of environmental information. 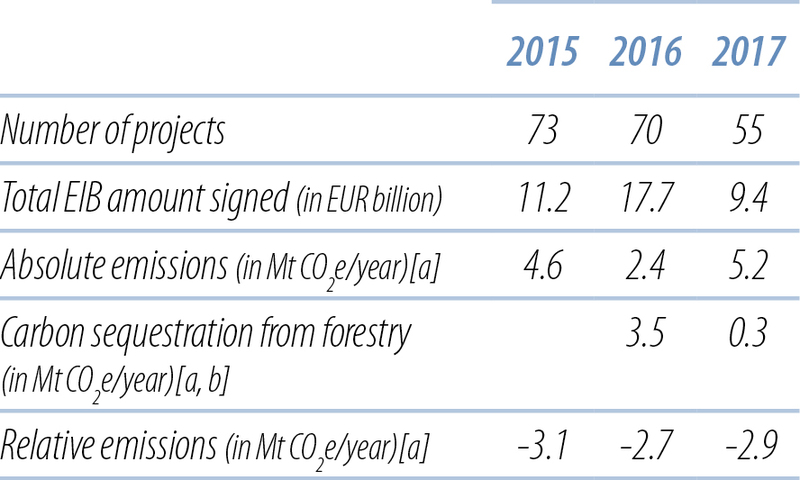 The table below shows the results of these aggregate figures for the last three years of EIB project carbon footprinting. The relative emissions figures show large overall savings of approximately 3 million tonnes of CO2e per year for the last three years. Overall, the EIB’s investment projects continue to support a path of reduced emissions. * Projects with a finance contract signed or large allocations approved in the year. Large allocations under already signed framework loans are those where the individual investment projects have undergone a full individual project appraisal. [a] Emissions and carbon sequestration are prorated to the EIB lending volume prior to aggregation. Total project emissions (absolute) and savings (relative) would be significantly larger. [b] Prior to 2016, carbon sequestration was included in absolute emissions figures. In 2016, when carbon sequestration exceeded total emissions, these figures were presented separately. The EIB Climate Strategy approved by the Board of Directors in 2015 indicated that the Bank would develop internal action plans detailing the activities to be taken to progress in three strategic areas: 1. Reinforcing the impact of our climate financing; 2. Building resilience to climate change; 3. Further integrating climate change considerations across all of the Bank’s standards, methods and processes. The ten action plans approved in 2017 organise in a coherent overall framework the ongoing and future actions needed to implement the strategy successfully. 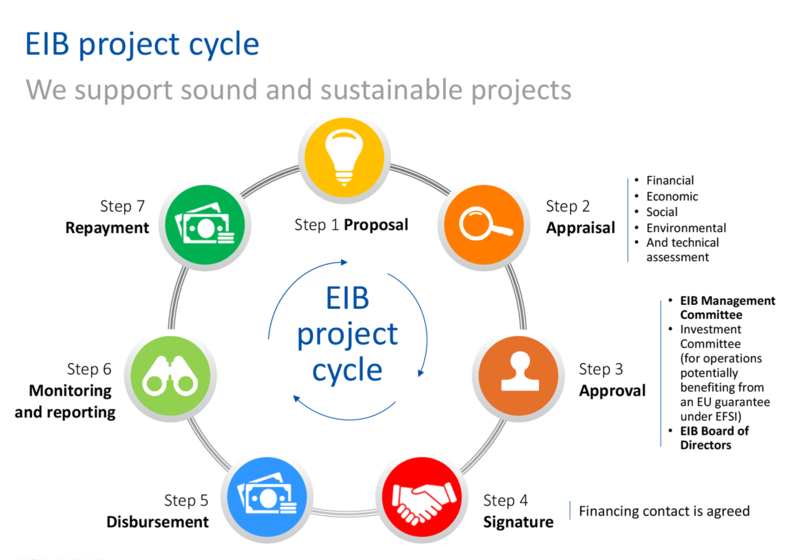 They are conceived as a planning tool to ensure progress in all areas, as they articulate the interpretation of the commitments and goals of the EIB Climate Strategy across the different EIB services involved and the activities needed to achieve those goals.